We are away on a weekend trip and will be back Monday Morning. Just off Adam Dunn's Glove in right. Just over Josh Willingham's head in left. Just missed by Justin Maxwell in center (which was a tough play). And just out of the reach of Cristian Guzman's dive as well (Although why he AND Anderson Hernandez were both covering second base on a steal attempt by Raul Ibanez/Hit & Run by Jayson Werth still needs to be answered). Every time this evening Our Washington Nationals needed a key defensive stop--they just couldn't do it against The Philadelphia Phillies. In fact, Ross Detwiler couldn't find the right stuff tonight just to keep from getting hammered at Citizens Bank Park. And just when Our Washington Nationals rallied down from a four run deficit to pull within one at 5-4 in the 6th inning, they just couldn't push across the tying run with Anderson Hernandez standing on second base. Justin Maxwell striking out and Ronnie Belliard lining out to 3rd to end the rally. Really, just when you believed The Defending Champions were there for the taking this evening, Washington couldn't make the key play. All on the very night just when you thought Jesus Flores would return and bolster our starting lineup from his rehab assignment for a hurt shoulder, a setback occurs and that most famous of doctors--Dr. James Andrews in Birmingham, Alabama--now has on his docket a meeting with Our Number 3 this Monday. Officially, it's just Tendinitis. Just can't wait to find the real answer. Much less the outcome of the latest saga involving JUSTice and Elijah Dukes. Seemingly trying to get his life back together, Elijah's past has again come back to haunt him. More legal fees to pay, another $40,000 sum by next Friday, June 5th or face 90 Days in Jail. Our Number 34 just needs to get these legal issues out of the way. And he better find a way soon, because if he doesn't--it's just going to ruin his burgeoning career--and sadly so. 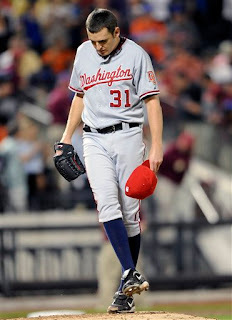 Just an all-around bummer of a day--to be a fan of Our Washington Nationals. Final Score from Citizens Bank Park, where virtually nothing went right for the visitors. The Philadelphia Phillies 5 and Our Washington Nationals 4. Just a little bit extra effort here, or just a little bit more hustle there and DC's Team might have made a better game out of this one. But that's just the story of Our Season so far. Washington heading into the weekend losers of four straight, 12 of 14 and 15 of 18. Just spinning around--searching to find their balance. And The African Queen and I just personally hoping Manny isn't the scapegoat for a team assembled mostly by someone no longer a part of Our Franchise. Ross Detwiler really got hit hard. The Phillies were socking his served baseballs all over their bandbox park. Blistering shots that continually where JUST OUT OF REACH of Our Fielders. It was frustrating because a couple nice defensive plays might have saved Our Number 48. Instead every shot mostly found the grass and that meant baserunners and plated runs scored for Philadelphia. Ross going just four complete innings, giving up five runs on 10 hits and one walk. Although clearly, a better defensive team might have given Detwiler more of a fighting chance on a night he wasn't his best. Joe Beimel was exceptional tonight in the bottom of the 7th.. Called on with the bases loaded and just one out, Our Number 97 got John Mayberry, Jr. to strike out and Former MVP Jimmy Rollins to pop to third. With Washington down just one run at the time, it was a crucial series and it kept Our Washington Nationals in the game. Josh Willingham with his 7th home run of the season in the 2nd off J.A. Happ. Willingham with two hits and two runs scored this evening. 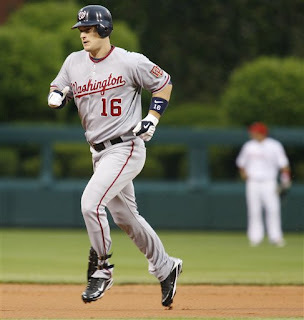 Ryan Zimmerman broke out of a Zero for 10 slump with a single in the 6th which began Washington's only rally tonight. And "The Guz" hitting a serious cold streak--now down to .329 after a Zero for Five night at the plate--falling quickly after being at .373 just last week. Just six hits total for Washington tonight. 15 for Philadelphia. And finally--in The NCAA Baseball Tournament this evening in Irvine, California--presumptive Number One Draft Pick Stephen Strasburg looked more human. And there is nothing wrong with that--he's probably pitched too much already this year and JUST needs to be shutdown. Just like Interim GM Mike Rizzo stated two Sunday's ago at The Smithsonian Associates Meeting at Nationals Park. Long after their playing careers ended both Walter Johnson and Babe Ruth could still pack a crowd into a ballpark. With World War II in full swing, the rationing of supplies in The United States and night time curfews in effect, arguably Baseball's Greatest Pitcher and Slugger got together once last time on the baseball diamond at Yankee Stadium. On August 23, 1942, in an effort to raise needed donations for The Army Navy Relief Fund, these two Original Members Of The Baseball Hall Of Fame & Museum squared off in The Bronx before a scheduled doubleheader between The Washington Senators and The New York Yankees. Walter Johnson was 55 Years Old. Babe Ruth was 48. Each would sadly pass away within six years. But on this hot summer's New York City afternoon, 69,136 baseball aficionados showed up to watch the spectacle. The second largest home crowd all season for The Yanks, one of only six turnouts above 50,000 at the venerable ballyard that year. "The Big Train" hurled 21 of what was left of his famous fastballs right down the middle of the plate to "The Bambino". And as everyone on hand watched with rapt attention--The Babe launched Johnson's third pitch into the rightfield bleachers at Yankee Stadium for a home run. Mostly though, Ruth struggled with his swings--Walter's rusty arm getting the best of Ruth's rusty swing. But never one to lose his flair for the dramatic, on Johnson's final pitch--Babe Ruth flat out HAMMERED "The Big Train's" offering HIGH, DEEP & INTO THE THIRD DECK of Yankee Stadium. A colossal blast, JUST FOUL, but good enough for "The Bambino" to trot around the bases to great applause--feeling the love of so many faithful that had adored him those many years. Walter Johnson meeting "The Babe" at home plate, congratulating him on his effort--letting his friend live in the moment. Walter Johnson's and Babe Ruth's Final Face-Off, August 23, 1942. The Picture Of The Day. A Little More Intensity Please!! 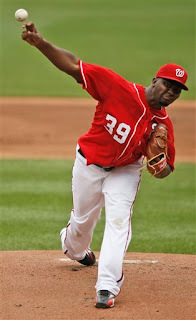 Our Washington Nationals need to play with a little more fire. That intensity which puts everyone on the edge. Sharp and ready for action--at a moment's notice. Over the past two weeks, DC's team seems to have lost some of that passion. Spirit that binds teams together. The "Go Get 'EM!!' necessary to be competitive. Consistent losing hurts every one's enthusiasm-but it shouldn't hinder being a professional on the field. Our Team that calls Nationals Park it's very home appeared to be walking through the paces last night in the series finale at "Obstructed View Field", defeated long before the game ended. And the latest controversial home run only deflected the real issue. For quite a few games now, the mental as well as physical errors have taken their toll on our ballplayers. We are not playing anywhere up to our capabilities. You can't tell us that a lineup with Cristian Guzman, Nick Johnson, Ryan Zimmerman, Adam Dunn and the healthy Elijah Dukes and Jesus Flores is terrible? Offensively, none of those six guys have been problems. You can't tell us not to get excited about John Lannan, Jordan Zimmermann, Shairon Martis, Ross Detwiler and Craig Stammen (all under 25 Years of Age) being in our starting rotation? As written before, that's Forward Progress in building from within. And you can't tell us a defensively fielding team with Ryan Zimmerman, Nick Johnson, Anderson Hernandez, "The Guz", Elijah Dukes, Justin Maxwell and Austin Kearns is awful? Are they world beaters? No, not by a long shot. But collectively Our Washington Nationals are just not putting it all together. The early season power surge offensively has recently seen an outage. Our Baby Starters are having their expected growing pains. And even Gold Glove Caliber fielders are stumbling a bit in the field. And Our Bullpen--well that's been a mess all season. Consistent losing hurts one's pride, but The African Queen and I don't want to see anybody lose faith in their abilities on the field of play. The Average of 20,000 Fans at Nationals Park have yet to give up on you. So please don't give up on us now. The Long 162 Game Season is barely past the quarter pole. The Dog Days Of DC's Sweltering Summer Looms Large. Time to get back on track, revive hope and give Our Fans positive momentum for when summer eventually turns to fall. A Little More Intensity Please!! The Philadelphia Phillies are next up at Citizens Bank Park starting Friday Night. If that doesn't get you fired back up--nothing will. 100% effort at all times during these growing pains. Only then can these mounting losses be more tolerable. And Manny--you don't have act like Earl Weaver (Classic Earl) or Lou Piniella (inciting a riot) or Carlos Zambrano (just being stupid) yesterday--that's all pretty embarrassing stuff they've all performed arguing with umpires. But it sure would be nice if at times you got out there on the field and protected Our Players on some close and controversial calls. Josh Bard being thrown out at the plate on Wednesday night and Jesus Colome's Phantom Balk last night well worth stopping the action and getting your two cents in. I thought Daniel Murphy's blast was a home run. The baseball changed trajectory upon hitting The Subway Sandwich Sign at Citi Field. Adam Dunn completely stopped chasing the ball as it flew over his head. The Mid-Atlantic Sports Network showed a replay from a left field camera that depicted the baseball bouncing back off the yellow & white sign. But only once was that angle shown. As bad as this Umpiring Crew butchered Gary Sheffield's Non-Home Run on Tuesday Night--their reverse call tonight was correct. They got it right at the end and that's all you can really ask for--no complaints about the reversal. But it still doesn't excuse First Base Umpire Adrian Johnson (3rd Base Umpire on Tuesday Night) for not hustling out as far as he can humanly get to track the deep flies. It's the umpire's job to anticipate any situation--not react after it happens. Never before do I recall hearing Adrian Johnson's name as an arbiter in any Major League Baseball game, so we won't judge him on these two controversial home runs--but we'll be watching closely from here on out whether Johnson's just had a bad day or two. One of those Off-Days in which Our Washington Nationals have had too many of--of late. Once Murphy's drive was ruled a home run. The two go ahead runs plated by The New York Mets took the final wind out of DC's Team. You could clearly see it on the field in the demeanor shown by Our Players. For the remainder of this affair--from the bottom of the 6th on--virtually no inspired play. It was almost like as if Washington was just playing out the string--getting it over with. And as much we love Manny Acta, it really bothered us when Our Manager didn't go to protect a terrible balk call on Jesus Colome in the bottom of the 7th inning. A phantom balk call on "The Human Rain Delay" for stepping his hind leg off the rubber, while not even being in the set position. It was a bad call and Manny should have been out there protecting his players from this Umpiring Crew. If not, anyone will continue to pull junk like that again and again. Advancing both inherited runners to second and third on the balk--both New Yorkers eventually scored to extend The Mets lead to 7-3 and really put this uninspiring game out of reach. When your team is struggling, and in the dumps, everybody else is going to take advantage of you. The Umpire's showed no mercy, neither tonight or in any of the just completed three games played in Queens. Nor did The New York Mets in sweeping Our Washington Nationals again. The sixth time in 2009 Washington has been swept by an opponent. Yet DC's team wasn't helping themselves as well. Ronnie Belliard failed to cover first base on a sacrifice bunt. Cristian Guzman missed a fly over his left shoulder in short left field that bounced off the pocket of his glove. Josh Willingham overran a fly into the leftfield corner at Citi Field that resulted in a double. Wil Nieves dropped a infield popup--but Ron Villone recovered and got the out. None errors, but all three extending innings, making pitch counts higher and giving New York additional Free At-Bats to score more runs. Just some very bad baseball tonight played in what is clearly becoming a poorly designed new ballpark in Queens. Citi Field's dimensions are too quirky, gimmickry and don't allow for a clean baseball game to be played. The walls are too short in some areas and too far from home plate in others. There is no rhyme or reason for its dimensions. As Charlie Slowes so aptly put it on WFED Tonight--"It's like someone designed the outfield walls using an Etch-A-Sketch." Funny, but true. New York City's New National League Ballpark has too many issues that affect play--including overhangs not in play. The Mets & The City of New York need to seriously make some corrections. Maybe an off-day in Philadelphia tomorrow will do Our Washington Nationals some good. They looked lethargic tonight. The very first time all year where we felt they had ZERO chance of winning--especially after Murphy's controversial home run. They didn't look good. They showed little emotion and it appeared Our Washington Nationals were sleepwalking through the final three innings of this game. Final Score from Citi Field where Our Washington Nationals are probably glad they don't have to return to Queens until September--The New York Mets 7 and Our Washington Nationals 4 in a troubling baseball game. Except for Adam Dunn's TOWERING two run homer of Johan Santana in the top of the 4th--there was little to get excited about tonight. And DC's team didn't put on the field an effort worthy of a Major League Team. Washington now 20 Games below .500 at 13 & 33. Even if they go 54-54 the rest of the way--their final record would only be 67-87. Johan Santana may well have pitched his worst game in a few years, walking six over six innings, giving up three earned runs and striking out 11 Nats Hitters. And somehow got the win--when Murphy's Homer gave him the lead after being taken out of the game for a pinch hitter. Adam Dunn's two run homer in the 4th off Santana was an absolute MONSTER. Over the bullpens in right, past the right field stands and into a walkway that houses a facsimile bridge of New York City. That was a BLAST!! Major League Baseball needs to review their Instant Replay procedure. Either get it right with the proper camera angle views or scrap it entirely. It's not working smoothly at all. Finally, "The Boys Of Summer" have dubbed the new Queen Ballpark "Obstructed View Field". Fans and Vendors alike can stand and block their view of the play-by-play. They are placed slightly down the first base line--behind a row of seats in the main seating bowl. Not ideal, and at least three times tonight, both Charlie Slowes & Dave Jageler had to pause, watch what happened on the television replay provided in the booth--to make the call. A play they could not watch in person. No, that's not good. 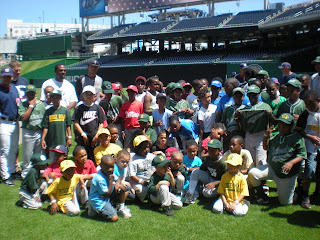 This past Saturday, May 23, Our Washington Nationals hosted the first of five youth clinics at Nationals Park. Sponsored by Smithfield, this is the second consecutive year the Virginia based Food Company has partnered with DC's Major League Baseball Team. The goal to expose more youths to baseball, enhance their skills while teaching proper training techniques. Nationals Hitting Instructor Rick Eckstein, Pitching Coach Randy St.Claire, Third Base Coach Pat Listach, First Base Coach Marquis Grissom and Bullpen Coach Randy Knorr were all on hand to assist the nearly 100 kids from The District's DC RBI Program (Reviving Baseball In Inner Cities). During the two hour session, the children rotated through six different work stations to receive instruction on hitting, fielding and throwing. Every single youth was given the opportunity to swing a bat in Washington's Indoor Batting Cages. And Assistant Trainer, Mike McGowan was on hand to provide tips on staying healthy. After the instruction concluded--lunch was served for all participants in The Nats Family Picnic Area on the main concourse near The Exxon Strike Zone. Each child receiving a Nationals/Smithfield Gear Bag and two tickets to an upcoming Nats Baseball Game at Nationals Park. 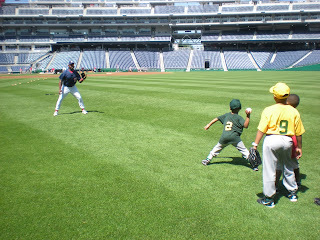 The next Washington Nationals Youth Clinic presented by Smithfield will be June 20. Other scheduled dates are July 25, August 22 and September 5. Online registration at Nationals.com will be available soon. Breaking News--Daniel Cabrera Designated For Assignment tonight after the game--not a surprise. Got to love Mike Rizzo's Comment: "I was tired of watching him." 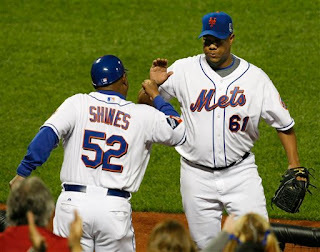 The sight of Vintage Livan Hernandez, circa early 2005, pitching for The New York Mets tonight at Citi Field brought back many a fond memories this evening for The African Queen and I. 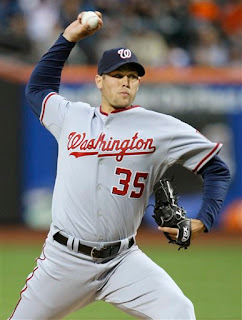 There was no player more larger than life during The Inaugural Season of Our Washington Nationals than Livo. He threw the first pitch in team history at Citizens Bank Park on April 4th, 2005. Old Number 61 then tossed the first pitch in the very first Regular Season Major League Game in over 33 years played in The Nation's Capital on April 14th, 2005 ("And here's the kick and the pitch and it's In There for strike one!!" --Charlie Slowes on the radio that night). Livan Hernandez was one of DC's first All-Stars, along with Chad Cordero, representing Our New Nats in Detroit that summer for The Mid-Summer Classic. He helped lead Washington to the top of the standings at that All-Star Break. The Greatest three months in Our Washington Nationals Short History. The Feeling Of Joy!! which resonated throughout DC that magical first half season of 2005 not to be forgotten. EVERYBODY WAS TALKING ABOUT OUR TEAM. You know that to be true. Night after night, Our Washington Nationals played before packed houses at RFK Stadium in 2005. The Old Ballyard on East Capitol Street became a SPECIAL PLACE AGAIN!! Rejuvenated, alive for a little while longer--a renewed venue for Major League Baseball. The Jumping Seats along the 3rd Base line. The Crowds. The Excitement--it didn't get much better than that. A Fan Base Was Born. So was The VERY LOUD AND ALWAYS CHEERING Section 320--where this blog began. And Livan Hernandez had alot to do with all that passion. Confident and relaxed--with the ability to go so deep into games--Livo was always willing to throw 150 pitches any time out on the mound attempting to go the distance. He was so fun to watch. It didn't hurt that The Burly Cuban could hit too. For all those reasons, and I am sure many more--we can never root against Livan Hernandez--or say anything bad about him. If baseball is entertainment--Old Number 61 stands on Center Stage. Hernandez is attractive and fascinating even if he is on the downside of one very interesting professional career. Forever, Sohna and I will fondly remember him for his work as a National. We've always believed, no one enjoys playing baseball more than Livo. 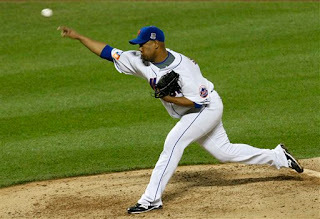 Tonight--Livan Hernandez shut down Our Washington Nationals for his 46th Career Complete Game. He was spotting all his junk, including that 60 MPH Whoop-DI-Doo Curve. His slop, when on, can have most any hitter lunging and falling all over the plate. Effective enough to toss in a mid-80's fastball to create even more confusion. Vintage Livan Hernandez on display this evening for The New York Mets--and Our Washington Nationals really didn't have a chance. Livo was just too good. Nick Johnson 0 for 4 (the ending of his 9 game hitting streak). Ryan Zimmerman 0 for 4 (the ending of his 43 consecutive games reaching base streak). 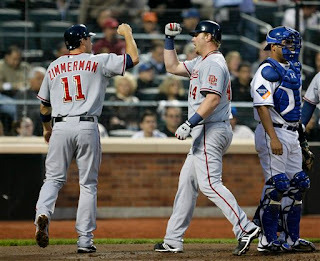 Only Adam Dunn touched Livo for his 15th Home Run of 2009--an opposite field shot to left in the 7th. 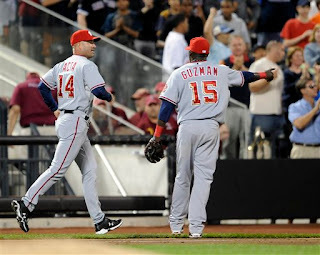 Livan gave up his usual large amount of hits (9), but he walked only one. And like the '05 Hernandez of Our Inaugural Season--when runners got on base against him--Livan was able to make just the right pitch to get out of trouble. Nothing worries Old Number 61 and Our Washington Nationals subsequently opposed little threat to him this evening in Queens. Final Score from Citi Field where one of The Original Faces of Our Franchise re-emerged on baseball's Biggest Stage--The Big Apple--and shutdown one of his former teams and teammates. The New York Mets 6 and Our Washington Nationals 1 in nine special innings. 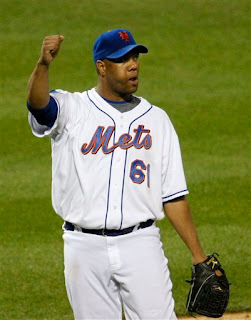 Like on nearby Broadway after a command performance, Livan Hernandez walked off the field tonight to a standing ovation. And watching from our home in Alexandria, Virginia--deep down in Our Hearts--we were sort of cheering for him too. That Wonderful First Season Of Washington Nationals Baseball Flashbacked To Life Tonight in Our Mind's Eyes. Thoughts Of Yesterday's Past--the very reason so many Washingtonians, Virginians and Marylanders were so THRILLED in the first place upon Baseball's Return To DC. Wonderfully Remembered This Evening--All Thanks To Livan Hernandez. We Can't Wait for Those Happy Days To Return Again. Craig Stammen got roughed up a little bit in his second Major League Start. 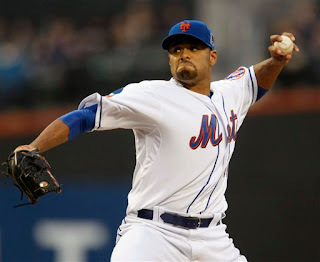 Facing a injury depleted Mets Lineup, he allowed seven hits and 2 walks over 5 complete innings. Stammen was OK, but Livo was far better. Craig's first Away Game In The Big Leagues was a learning experience--nothing more. He could have also been helped in the bottom of third on a grounder to Cristian Guzman hit by Fernando Tatis. Moving to his left, it appeared "The Guz' could make a play and possibly turn two with Mets runners on first and second base. Instead, the baseball scooted past Our Number 15's glove, between his outstretched hand and body for a run scoring single. The resultant non-defensive play quickly led to two New York Runs. Jason Bergmann pitched a solid 6th, then got torched by Gary Sheffield on a screamer of a three run homer in the bottom of the 7th. Sheffield's second home run in as many nights, put this game out of reach. But unlike last night's controversial round tripper--this one had no doubt. But that didn't mean The Umpire Crew got away without a little controversy again tonight. Josh Bard was attempting to score from second base on a two out single by Craig Stammen in the top of the 5th. With Stammen's bat lying in the baseline and Angel Pagan's throw from centerfield beating him to the plate--Bard attempted to deke his way around the rear end of home plate. New York's Catcher Omir Santos originally missed the tag. As Josh dove for the plate a second time--Santos snuck down his glove on Bard's fingers as he touched home. Home Plate Umpire Dan Iassonga appeared as if he was going to call safe--then gave the out sign instead. Josh Bard argued. Our Manager Manny Acta didn't come out to question. One replay from up high behind home plate--showed Bard's fingers on the plate an instant before Santos' glove touched him. But it's still not clear because another angle showed the catching mitt shoving Josh's finger from the plate. Our Washington Nationals hit into three rally killing double plays tonight. Cristian Guzman, Adam Dunn and Josh Willingham all had two hits apiece. 13 Wins & 32 Losses after 45 Games. We don't think anybody expected such a poor record. Catcher Luke Montz being recalled as an emergency replacement for Josh Bard--who is leaving the team temporarily to be with his wife having induced labor in Denver. Jesus Flores caught seven innings tonight for AA Harrisburg, scheduled to play nine more tomorrow. He is expected to be activated on Friday in Philadelphia, Saturday the latest. No corresponding roster move for a pitcher expected--Washington will go with their now current 12--five starters and 7 relievers. The very moment the name Sonia Sotomayor popped up as a serious candidate to replace retiring Supreme Court Judge David Souter--I knew that name. There was something special about this lady and sports that I just couldn't quite remember, but I knew it was big. Didn't take long to refresh the old noggin and find out. In 1995, as a U.S. District Court Judge for the Southern District of New York, Ms. Sotomayor issued an injunction against Major League Baseball's Owners effectively ending the longest work stoppage in professional sports history. The lockout that decimated the 1994 Season, cancelled The World Series--and without anyone really understanding at that time--put in motion all the issues and subsequent problems for baseball in Montreal. The Expos were Baseball's Best Team in 1994, drawing consistently over 2 million fans per season--and Canadian's never forgot what Major League Baseball did to them. The long drawn out saga of The Montreal Expos was just beginning. 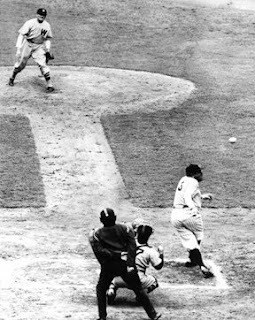 A climax that resulted in relocation and resurgence of Baseball, across an international border, In The Nation's Capital of The United States. 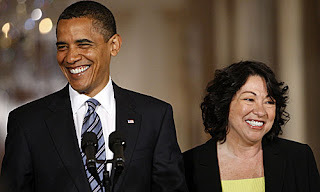 Judge Sonia Sotomayor was nominated by President Barack Obama this morning to become the first person of Hispanic decent and third woman to sit on The Highest Court In This Land. She's a fan of baseball, some publication's called her Baseball's "Savior" back in 1995. But even her attempts to save The Great Game back then, couldn't help the Franchise now known as Our Washington Nationals. What's the use in having video replay if a fan CLEARLY leans over and obstructs play to one team's advantage and the umpires don't overrule? The integrity of the game was on the line tonight in the bottom of the 6th inning in Queens. The New York Mets Gary Sheffield launched a John Lannan Fastball to left centerfield with two runners on base--near the top of the wall at Citi Field. A fan leans over the fence by about two to three feet and--without a doubt--obstructs the action by touching the baseball with his glove. The ball WAS NOT going OVER the wall. The baseball was heading downward. One run would have definitely scored on a ground rule double for interference. Instead, 3rd Base Umpire Adrian Johnson ruled a three run Home Run. After an argument by Our Manager Manny Acta--The Umpiring Crews went to the video replay. A decision that took nearly 10 minutes to inexplicably make. And the call was NOT reversed. Sorry, but that decision was incorrect. It was the wrong call and that feeling has nothing to do with the fact that The African Queen and I are cheering for Our Washington Nationals. No matter the circumstance, The Umpires should have made the right decision and reversed the home run and let the game continue with The Mets now ahead 2-1. The Men In Blue had all the necessary tools available to make the proper decision. And there is NO EXCUSE for that error in judgement. This group failure changing the complexity of the game and giving The New York Mets a undeserved 4-1 lead. No question, Our Washington Nationals had multiple chances to come back and win this game in the subsequent 7th, 8th & 9th innings tonight at Citi Field. They eventually left 13 runners on base; were 1 for 10 with runners in scoring position. 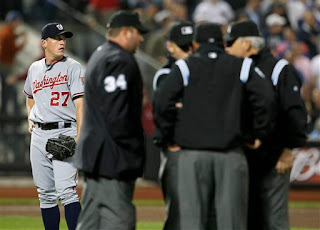 A little clutch hitting by Washington could have helped to take away the sour taste of a poor ruling by The Umpires. But whether Our Washington Nationals win or Lose any battle--The Integrity Of The Game should be maintained at all times. A fan interfered with play tonight in Queens and the arbiters of judgment--The Rulers Of Every Game--chose to ignore what everyone clearly saw with their own eyes--not only on the field of play--but while watching multiple television replays after. Home Plate Umpire Larry Vanover and his crew have some explaining to do. And if Major League Baseball has the guts to officially say the ruling was incorrect--MLB should fine the umpires for losing control of the game--although I doubt their union would stand for that, much less a suspension. Final Score from Citi Field where Fan Interference changed the outcome of tonight's game--The New York Mets 5 and Our Washington Nationals 2. The 31st Loss of 2009 will be remembered for one disappointing ruling on the field. And recalled for it's frustration--because Washington had bases loaded with one out in the 7th and scored just one run. Had runners on 1st and 2nd with no outs in the 8th--and didn't score again. Finally, DC's Team had runners on 1st & 2nd and one out in the 9th--and couldn't push anyone across the plate. 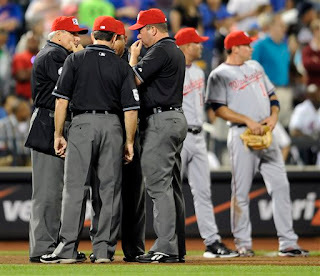 Multiple chances were still there for the taking, but Our Washington Nationals could not find the strength to overturn that bad umpiring decision and win despite all odds. An all around bad night of baseball involving Our Washington Nationals. John Lannan had a poor outing this evening. Although tagged for Sheffield's So-Called three run homer, Our Number 31 gave up 8 hits, four walks and struck out no one. He wasn't sharp and didn't look comfortable all night long. As far as Daniel Cabrera is concerned, can we please just Designate Him For Assignment? Please, just eat the salary. He's not helping. Tonight, called on to pitch the 8th inning, Cabrera again couldn't find the strike zone, walked three New York Batters and threw one more wild pitch and multiple more pitches in the dirt--thankfully blocked by Wil Nieves. Jason Bergmann was eventually called on to save him on the mound. But Daniel is clearly not an answer, for now or later. He has no confidence and is throwing his fastball 10 MPH slower than just two years ago. Something is wrong with him. Let him figure it out--elsewhere but here. Ryan Zimmerman extended his consecutive games reaching base streak via hit, walk or hit-by-pitch to 43 games tonight with a single and walk--tying the single season franchise record of Tim Raines (of The Montreal Expos). Rusty Staub (an original Expo) holds the Franchise Total Consecutive Games Reaching Base Streak (tallied over two seasons) at 46 games. Wil Nieves continues to swing a hot stick. Two more hits this evening, one rbi and one run scored. He's playing well and really is a fine backup catcher--dependable. Finally, although he did not do well with runners in scoring position tonight for Washington, Austin Kearns again displayed his defensive prowess. When Gary Sheffield sliced a liner to right field in the bottom of the 1st inning with two outs, Carlos Beltran took off from 2nd base, rounded 3rd and headed home--looking to score. Like he always does, Our Number 25 deftly moved in on the fast approaching baseball, scooped it up and UNLEASHED A PERFECT ON THE FLY STRIKE to Wil Nieves standing on home plate. Beltran was out by a mile. The Defensive Play of This Game proved again that Austin has value--even when not getting the clutch hits at the plate. That listing ship maybe better known as "D.C. Nats" has been treading water over the past 11 days of what sadly has come to be known as a bad homestand. Losers of nine out of their last 10 games at Nationals Park, Our Washington Nationals now found themselves weighted down, sinking slowly, attempting to let loose of that anchor around their necks sending them deeper and deeper into the bottom of the league standings. Almost at the point of drowning. No question, despite the fine efforts of Our Baby Starters, it's not been pretty in NatsTown. Make no mistake about it, DC's Team has struggled, unable to put together even an modest winning streak these past 11 days. A predicament now faced with The New York Mets & Philadelphia Phillies up next--on the road--in two of the most challenging cities to play any baseball game. But for this Sunday--Baltimore was on the schedule. The final game of the opening Battle Of The Beltway Series. The first of two meetings between these two struggling teams in 2009--Home & Away. Engagements that had fallen The Orioles Way these past two nights. Now, with Our Washington Nationals on the precipice of being swept by Our Closest Rival--with bragging rights on the line--something, like anything, had to give. The African Queen and I can't go to Camden Yards in June knowing Our Team has been swept by Baltimore's in our very back yard. Pride was on the line today, and that ship known as "D.C. Nats" needed to straighten itself out. Pull themselves out of the muck and find any way to move forward--full steam ahead. This was no joke. Our Washington Nationals needed a win. Of course that Curly "W" seemed out of the question when The Orioles built a three run lead by the end of the top of the 5th inning. A 3-0 advantage that certainly looked like more of the same ole--played out over the past few days. Not even treading water any longer, Our Washington Nationals were sinking ever so deeply into the abyss. Until, when you least expected it, the working men, those sailors on board, mounted the first response. No one could have predicted that some of those sailors on board--Austin Kearns, Wil Nieves and even Pitcher Shairon Martis would stroke back to back to back doubles off Baltimore's Brad Bergeson in the bottom of the 5th frame--scoring two runs for Washington. An attempt to not just man the life rafts and raise the white flag, but buoy the ship, get "D.C. Nats" head back above water--make a course correction--and push ahead. A surprising series of events that had the announced crowd of 30,880 back into this ball game. Cheering, awake again and looking for more--wanting the complete comeback--the expected lead. The raising of that weighted anchor that has kept Washington down for so long on this extended home trip. Adam Dunn would raise hope and put Our Washington Nationals back into the lead in the bottom of the 6th with a two run homer to dead centerfield--with Ryan Zimmerman on board. Playing Captain today, Our Number 44 decided he wasn't going down with the ship. And neither were his crewmates. This game was back on--and would teeter back and forth again before Big Adam decided to take matters into his very own hands. Yes, that fabulous young centerfielder of The Baltimore Orioles--Adam Jones--countermanded Captain Dunn's latest orders with a blistering message of his very own. A two run homer off Shairon Martis in the top of the 7th inning that stalled "D.C. Nats", put The Vistors back in front 5-4 and again found Washington's engines sputtering--for what turned out to be--thankfully--the last time this Sunday Afternoon. 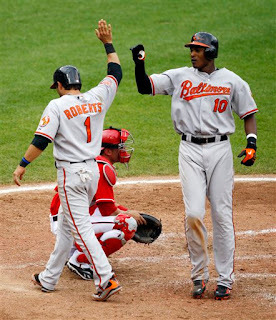 (By the way, love those Gray Away "Baltimore" Script jerseys with City Flag Logo on their sleeves--very nice). Amazing as it may seem, and despite a dislocated right pinky finger, Anderson Hernandez was back on deck, manning his regular position of second base--after he pinch hit for Ron Villone in the bottom of the 7th. And Anderson led off the most important frame of this game with a seeing eye single to right field off Baltimore's Chris Ray. A repeat performance carried out by Willie Harris when he also slapped a seeing eye single to right, putting runners on 1st and 2nd with nobody out and the very possibility of Our Chief Engineer--Ryan Zimmerman--that so called Franchise Player--up next--to hopefully slam home the tying and go ahead runs. A moment that had everyone at Nationals Park interested. Yet with today's boat Captain, Adam Dunn, on deck to follow The Z-Man--who actually believed The Orioles Ship Captain, Dave Trembley, would intentionally walk Ryan? Manager Trembley's thoughts of letting his lefthanded reliever, Jamie Walker, play his own on-deck fireman, would change the very course of the "D.C. Nats" ship this day. Baltimore's skipper believing--The Big & Heavy Fire Power of Dunn was an easier out than getting the always solid stroke of Zimmerman. Floating on water, each listing ship looking to right itself--the final battle was coming to a head. Who would sink whom? Did it ever end in grand style!! What's always been surprising about Adam Dunn is his innate ability to seemingly launch a nothing pitch--a rocket--deeper and deeper into the blue sky. And on this Sunday Afternoon, Our Number 44, The Captain Of "D.C. Nats" this Memorial Day Weekend--arguably one of the most powerful hitters in the game--let it be known. Don't mess with Our Chief Engineer--Zimmy--when Our Captain has his back. Dunn would get ahold of Walker's sixth pitch of this At-Bat and launch it deep to left field, the opposite way for him, and into the visitors bullpen at Nationals Park. Dunn's second home run of this game, 14th of the season--A Grand Slam--which lifted Washington Fans out of their seats. Lifted Our Washington Nationals out of the ever deepening waters--and set this once sinking ship on a new course. All hands were now on deck and it's sailors greeted Our Number 44 in the wheelhouse (the dugout)--thanking him for his course correcting blast. The final salvo that lifted this ship known as "D.C. Nats" out of threatening waters and sailing forward again. The Anchors Away!! signal was finally sounded. Our Number 44 had personally set off the alarm. And Our Washington Nationals were again moving full steam ahead--bearing down on victory--and realizing all is not lost when teamwork gets you back into the game, levels the ship and pushes everyone ahead, together, as only a real team can. Pitchers Joe Beimel and Joel Hanrahan would close The O's out over the last two innings of play. Final Score from Nationals Park where that ship known at "D.C. Nats" set sail to New York City tonight prepared to take on The Mets from Citi Field on Memorial Day Evening--Our Washington Nationals 8 and The Baltimore Orioles 5--in nine satisfying innings. Curly "W" Number 13 of 2009 a much needed grasping of the life ring. The salvation from a crew needing to pull together under tough times and proving, once again, all is not lost. The Bang!! Zoom!! Of The Fireworks!! letting everyone know no team should mess with the top of Our Lineup--nor should they take the bottom half for granted. Washington's is too powerful. You might be able to fool one or two hitters--but when it counts the most--don't mess with Our Engineer, Ryan Zimmerman. That will only upset Our Captain, Adam Dunn--who signed up today to be an anchor himself--depended on when times gets tough. In manning up, he help lift that heavy anchor weighing down Our Washington Nationals--that collar around Our Necks. With solid starting pitching continuing and a bullpen that has been decent over the past four games, all Washington needs is the re-emergence of their powerful offensive threats again. The final Red Alert that opposing teams must respect, because DC's team is an emerging power, if they can only run a very tight ship. "D.C. Nats" sailed away from their abyss this afternoon at Nationals Park. Looking to continue this latest successful voyage in Queens and South Philadelphia. Locations where not only must all those heavy anchors be put away, but all hands must again be on deck. But at least for one afternoon--Our Washington Nationals provided the necessary firepower to dislodge themselves from the malaise of a just finished 2-9 homestand at Nationals Park. Any win is good, but defeating The Orioles and not being swept at home a mark of pride that should leave anyone that roots for Washington proud. And makes it far more easier for The African Queen and I to travel to Baltimore next month for the continuation of this ever intriguing series. Until Our Manager Manny Acta decided to test Shairon Martis for one more inning--the 7th--you could say he had a pretty solid outing. But with no one warming up and Martis allowing a leadoff single to Brian Roberts and a liner of a blast home run to Adam Jones two pitches later--Our Number 39 had lost his lead, his quality start and fortunately settled for a no decision--thanks to Adam Dunn. Martis is very interesting to watch. He never seems overpowering, but he does get outs--consistently so. And when he's in trouble, Shairon tends to bear down and actually perform better. One of the most interesting young players currently on our roster--this 22 Year Old is a solid hitter at the plate, good baserunner--and always make us wonder--how good could he actually be? Fascinating, because no one really knows much about him--everyone learning day by day. Ron Villone picked up the vulture win when he held The Orioles in the top of the 7th after Martis gave up his Two Run Shot to Jones. And Washington came back to take the lead, thanks to Dunn's Grand Slam. Villone has yet to allow an earned run. He hasn't been perfect, but Ron's been a solid pickup for a beleaguered bullpen. Joe Beimel pitch a 1-2-3 8th and Joel Hanrahan picked up his 5th save of 2009 when he again came out firing strikes--getting two Orioles to whiff and ended this affair when Aubrey Huff grounded out to Anderson Hernandez at second base. Speaking of Hernandez, in the top of the 8th, Baltimore's Brian Roberts slashed a liner toward the hole between first and second base. Anderson, in the game as a late inning substitute for Ronnie Belliard, quickly ranged to his left, eventually dove and SNARED the baseball while diving--a split moment before it hit the ground. A terrific play in any game, but nothing compared to the work of Austin Kearns, who made every attempt to outdo himself. Just before Hernandez made his fine play, Robert Andino skied a fly down the right field line--near where the stands jut out toward the field. Our Number 25 ran hard, saw the baseball all the way, and ran hard into the padding--while getting his left foot CAUGHT on top of the barrier. Loosing his balance and falling over--Austin Kearns STILL MADE THE CATCH for the out. An outstanding defensive play, worthy of The Defensive Play of This Game--if not for "Bluegrass'" effort in the very first inning of play. Nick Markakis would unload on a Shairon Martis pitch to the right field scoreboard wall. A liner that was over Austin's head, but not out of reach. The only problem--the electronic wall and it's chicken coop fencing was nearing. Without fear, Kearns' tracked the baseball all the way--and while crashing into the wall headfirst--MADE THE CATCH! !--then fell down after colliding with the screened fence. Austin Kearns was OK, but that catch was Fabulous. One of three excellent defensive plays this day at Nationals Park worth seeing in person. Our Offense returned today scorching 12 hits. Willie Harris, Adam Dunn, Austin Kearns and Wil Nieves with two apiece. Dunn with a career high 6 RBI this afternoon. 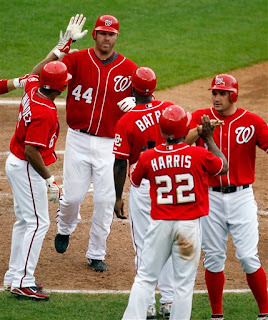 Ryan Zimmerman extended his consecutive games reaching base streak to 42 with a single moments before Dunn's first home run of this game. Dunn now has 39 RBI--that's pretty good folks--getting back on track a little bit at the end of a personally disappointing homestand at the plate for him. Nick Johnson was pulled from the starting lineup moments before the game start due to what was called stomach discomfort. OK now, NJ is with the team as they head to New York for Monday's Memorial Day Game against The New York Mets. This Sunday was Kid's Jersey Day at Nationals Park. Each child 12 Years Of Age or younger received a Ryan Zimmerman Jersey or a voucher for a jersey along with a Zimmerman Tee-Shirt from Exxon Mobil. Nothing like watching parents dress their kids in the new outfits right there in Centerfield Plaza. 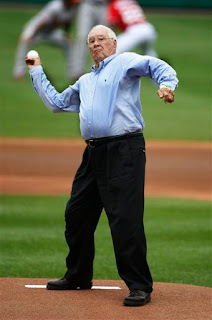 Cleveland Indians Hall Of Famer, Bob Feller, threw out The Ceremonial First Pitch Today. In the 4th Inning Presidents Race, Teddy was seeking revenge on The Oriole Bird for taking him out while leading in Saturday Night's Race. With The Bird on the Warning Track in right field--Our Lovable Loser crushed The Bird into the outfield wall, knocked him down, then continuing the race as GW, Tom & Abe ran past. Teddy would finish second, but George would win the race. Later as part of Washington Nationals Dream Foundation Day at Nationals Park there was a special Dance Off by fans in two different sections to see who would win one of the new Eco-Friendly Curly "W" Totes. The Male Contestant won over the Female, but their efforts were nothing compared to the "Dancing With The Stars" segment which played out high and above the South Capitol Street Ballpark moments later. With Wil Nieves heading to the plate to bat, his salsa batting music again set The "Boys Of Summer" into high spirits. Anyone watching The WFED Radio Broadcast Booth witnessed Charlie Slowes, Dave Jageler and "The Jack Of All Things" swaying to the beat. It's very funny, and I think we now have a large group of regulars in Section 218 looking in anticipation of their act each time Nieves steps to the plate. Funny stuff. Finally, there may not have been a more thrilling National Anthem nor God Bless America renditions sung at Nationals Park since the ballpark opened in 2008. Five Year Old Kaitlyn Maher sung a wonderful Anthem, then stunned the crowd and nearly every single player on the field with one of the most beautiful God Bless America tributes in some time. The very sight of this very petite young girl singing while every single person on the field craned their necks to personally witness and experience the moment--maybe worth more than the game itself today. She was terrific and I don't think anyone was not smiling at the conclusion of God Bless America. Really touching and a highlight that should be remembered for some time. She was so tiny, yet could bellow out the words. What a moment!! It's not too late to make your $5 donation. Sunday was Washington Nationals Dream Foundation Day at Nationals Park. Our Team's Charitable Arm was recognized for its ongoing support provided throughout Washington, DC and the surrounding communities. The Foundation's three cornerstone projects were presented on a video played on The HDTV Scoreboard--providing details of the many efforts put forth by The Dream Foundation. Additionally, all volunteers from this past Friday Morning's NatsTown GreenUp wishing to attend this afternoon's game against The Baltimore Orioles were publicly thanked on the field before the start. The entire contingent taking a group photo while receiving a nice ovation from those on hand at Nationals Park. Throughout today's games, fans were encouraged to donate $5 toward The Dream Foundation through a specially set up Dream Foundation text message number. By just placing a "DC" to 90999 text from any one's cell phone, a $5 donation would be accepted by the charitable arm of Our Washington Nationals Baseball Club. Sohna and I did so this afternoon. Finally, The Washington Nationals Dream Foundation Kiosk in Centerfield Plaza this afternoon started selling their specially designed reusable totes. The Eco-Friendly Green with Blue Curly "W" Bags are available for $5 and will be on sale for every single home game for the remainder of 2009--until they sell out. The African Queen and I picked up two this afternoon before the start of this 11 game homestand's final game. Text "DC" to 90999 is still a good number and you can help the ongoing work of The Dream Foundation by sending your $5 donation today. The creation of The DC Baseball Academy; the construction of The Washington Nationals Pediatric Diabetes Care Complex at the Children's National Medical Center; and The Neighborhood Initiatives Projects--which include partnerships with The Boys & Girls Clubs of Greater Washington, The Earth Conservation Corps and other local non-profits await your support. And remember, the $5 Eco-Friendly Curly "W" Totes will be available at every single home game at The Dream Foundation Kiosk in Centerfield Plaza until they sellout. Reminder--it's all for a good cause to help others in need. Yes, you too can go green at Nationals Park! !